Over the grand sweep of history, two universal megatrends stand out: Connectivity and urbanization. Today, both are accelerating at an unprecedented scale with globe-spanning infrastructure investments in the domains of transportation, energy and communications, and in the rise of megacities on every continent. As the world transitions from the Westphalian system towards a more fluid, neomedieval one, what can we glean from the past and project into the future about the role of cities in global order? 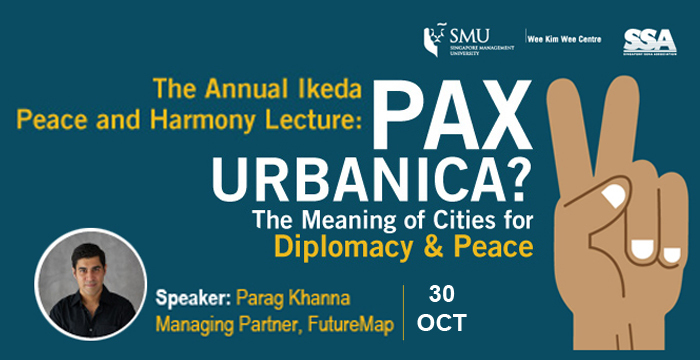 As cities accrue authorities through the processes of domestic devolution and international network formation, can they lead us into a Pax Urbanica, an age of peace among cities? Parag Khanna is a leading global strategy advisor, world traveller, and best-selling author. He is Founder & Managing Partner of FutureMap, a data and scenario-based strategic advisory firm. Parag's newest book is The Future is Asian: Commerce, Conflict & Culture in the 21st Century (2019). He is author of a trilogy of books on the future of world order beginning with The Second World: Empires and Influence in the New Global Order (2008), followed by How to Run the World: Charting a Course to the Next Renaissance (2011), and concluding with Connectography: Mapping the Future of Global Civilization (2016). He is also an author of Technocracy in America: Rise of the Info-State (2017) and co-author of Hybrid Reality: Thriving in the Emerging Human-Technology Civilization (2012). In 2008, Parag was named one of Esquire’s “75 Most Influential People of the 21st Century,” and featured in WIRED magazine’s “Smart List.” He holds a PhD from the London School of Economics, and Bachelors and Masters degrees from the School of Foreign Service at Georgetown University. He has travelled to more than 100 countries and is a Young Global Leader of the World Economic Forum.